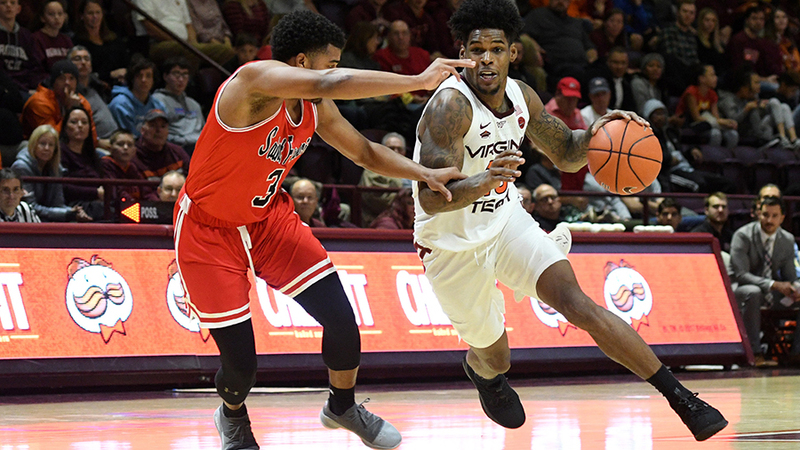 Buzz Williams and Ahmed Hill provided some macro level insights following a convincing win. Virginia Tech doubled up Saint Francis, with a point to spare. Ahmed Hill dropped 19 points in the 75-37 drubbing. Good teams handle their business, and ultimately the No. 13 Hokies did just that. However, it was a tight contest late in the first half — 23-23, Tech with 3:42 left — before the Hokies blew the doors open. The comfortable win provided some candid post-game reflection, especially from Buzz Williams. The Red Flash drained 4 triples in the first half, which led Williams to go in-depth on defensive triangle concepts. "You want to play with flat triangles," said Williams. "And the taller your triangle is, the worse shape you are in defensively. And you want to hold that flat triangle, as long as you can, as much as you can. When the triangle changes shapes, it's because somebody didn't guard the ball, and we need help, and then you're in rotation. What we got to do is, hold that triangle, hold that flat triangle longer, better which means we need to guard the ball better. But too often times so far through five games, we're helping guard the ball, which takes us out of a flat triangle when we don't need help guarding the ball, and understanding the line of 'yes he requires my help, no he doesn't require my help'. That's where we're struggling, and at times particularly in the first half they got threes because we were helping, when we didn't need to help. Much better in the second half of holding the triangle, and not helping." Williams touched on minute allocation for his bigs bigger players, and the need for "Mean P.J." (Horne). "Well K.J. (Kerry Blackshear Jr.) through five games is playing 20 minutes, which is what he played tonight," said Williams. "And the effectiveness that P.J. played with tonight was dramatically better than he had the previous four games. We're going to need him to have more of an impact, and we're going to need K.J. to be able to play more than 20 minutes. I was encouraged by P.J. What I've been telling him is, we need him to be mean P.J., need him to be mean, and I thought he was more mean in how he played today." Horne played 20 minutes, grabbed 4 rebounds, and chipped in 8 points. Although Williams admitted when Horne is in the game, the "play catalog shrinks significantly". Hill revealed his defensive shortcomings contributed to a dip in minutes last season. He averaged 29.7 minutes in 2016-17, 25.2 in '17-18, and thus far in '18-19: 35.0. "Last year I wasn't capable of being who they thought I would be, or being the defensive player," said Hill. "Minutes got changed. That's something that happened, it's a job. This offseason I focussed on playing better defense, learning the positions, learning when to rotate, things like that. I always had confidence on the offensive side, but I would lose confidence defensively, and just think about messing up all the time." The season is still young, but Hill's field goal and three-point percentages are both above 50 (53.7% and 56.0%), career highs. And finally, there was this tremendous fastbreak dunk. Slow start had me like "meh"... and then this team just turned it on and reminded me why I feel this is at LEAST a sweet-16 team. Bad opponent, no doubt. But to see the guys not be cool with early effort just light them up was a lot of fun. They're hungry, and it shows. Thanks, Joe, for reminding us of our other revenue sport's good fortune while most of us were in post-15STRAIGHT euphoria. I like what we're doing on the hardwood. Was this game on actual TV? No it was ACC Network although if you have Xfinity then they are playing all the games through the TV. This is all ridiculous. At this point unless it get cleared up within the next few weeks, it may be better for him to just redshirt instead of using a year's worth of eligibility on half of a season. If we haven't played more than a few ACC games, he will play this year. He is too good of a talent and we need his height when blackshear fouls. Buzz talking about flat triangles? Illuminati confirmed. I'd recommend listening to the segments involving Buzz, but the gist is that Buzz called KJ the guy on the team with the best defensive awareness. Buzz also said he often gets so many fouls out at the 3 point line because he's covering defensively for guards who messed up. Exactly. The whole "KJ should never be near the perimeter" narrative is idiotic and yet I see it every time he picks up a foul. He may have the best defensive awareness but he doesnt have the best defensive execution. His value of being on the floor, especially when we get to the ACC schedule outweighs him covering a missed guard assignment. I would rather he give up the open look out there than pick up the cheap foul when the guard decides to blow by him and he reaches down. A single attempted basket is less important than having Blackshear for another five minutes on the floor especially since the Nolley situation hasnt been cleared up. The offense stagnates with Horne out there many times. Having Blackshear down low on the offensive end gives us that lob and score option. Look at it this way, Blackshear has been averaging 12.2 PPG and 4.2 RPG in only 20.2 MPG. Horne on the other hand is averaging 3 PPG and 1.8 RPG in 16.6 MPG. That means KJ is scoring over a half point per minute on the floor. Thats 3 to 4 points a contest if he even manages to stay out there for five more minutes, which is huge considering 9 or 10 of our ACC games were decided by three baskets or less. FWIW, Buzz agrees with you and said that KJ needs to be on the floor more. He was just explaining to the broadcast team why KJ is picking up those fouls. He also had an anecdote about the offensive fouls KJ was picking up - one of the officials came to him at halftime and said, "I think I figured out why the big is getting called for them." And Buzz proceeded to talk about how KJ's heel never touches the ground, so it looks like he's setting a moving screen. Something you'd mentioned somewhere else on this site, if I recall correctly. Buzz also had a funny dig at LeDay - the broadcast team made mention of how LeDay would come off the bench instead of starting since he had a tendency to pick up fouls early too. Buzz basically said, "That's cause Zach isn't very smart, not because he was trying to cover up for others mistakes." It sounds a little mean when it's typed out like that, but he was laughing while he said it. Would have liked to see Landers Nolley play a minute or two at the end of this game. WTF is taking so long? Edit - thanks Joe...I see just a couple posts up that the end is near.